What is the blockchain art exchange? 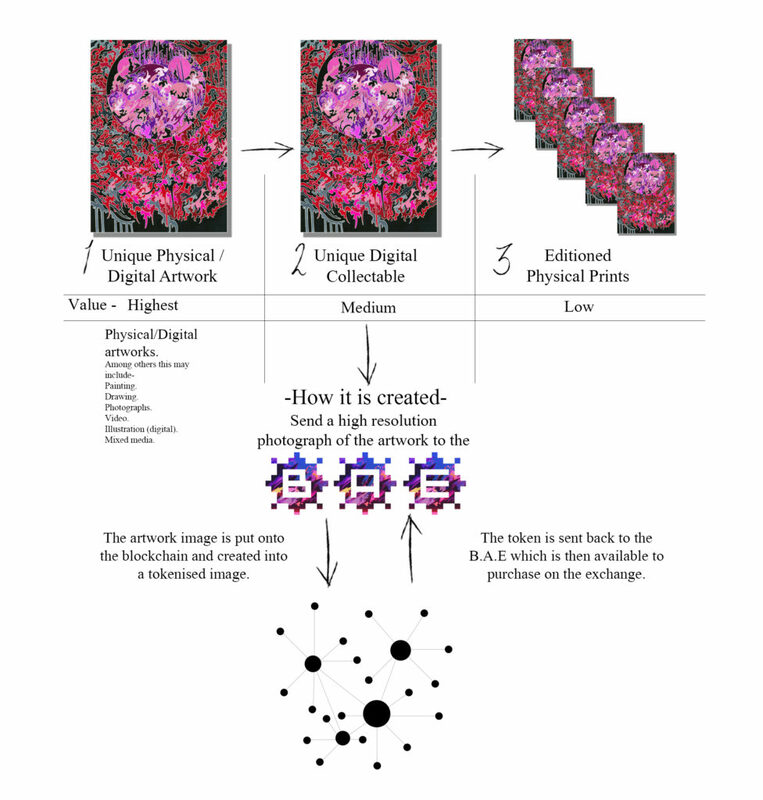 The Blockchain art exchange is simply put a place where artists can make unique ‘digital prints’ from any artwork, be it; video art, paintings, digital photography, jewellery designs, graphic designs, 3d renderings or scans, fashion designs or VR experiences if its artistic we want it. On the site we call our product crypto collectables but the best way to think of them is unique digital prints. Why are you using blockchain? Blockchain technology has the power to make digital files, which includes images and videos, unique, trackable and tradable. This opens up a new form of art trading and exchange and creates a new way for artists to sell their work. What blockchain are you using? We use Ethereum blockchain as it is the first smart contract blockchain, having been proved longevity and already has many Apps running on it. Why would anyone want to buy a unique ‘digital print’? The same reason people buy physical art, it’s a unique collectable and they appreciate the artwork. An example of these people is found in crypto kitties where blockchain cats sell for over 100k pretty often. How do I display the art? During our beta/early access phase you will only be able to view artworks at a smaller capacity, videos will not be able to be played during this phase also. But once the Beta /early access phase is over, we plan to create an B.A.E app compatible with all smart TVs, computers and smart phones, so you can view all mediums of artwork purchased and sold on the B.A.E platform. If you want to use you digital art now you could check out https://www.cryptovoxels.com a Vr world where you can own digital land and put up digital artworks. What do the digital standard gradings mean? The grading shown on each artwork reflect important objective information about the quality of the file. Depending on the type of file uploaded the grades reflect different qualities Why do we do this? We believe that an investment should last forever and be future proof these grading’s work to ensure that the buyer is fully aware of what they are buying. It’s worth noting we are very harsh on our grading jpegs will score a D in file format and PPI of 300 is also a D which most artists would say is standard. We only give the best of the best an A grade. For works created on Photoshop, photography and scans the grading is different there is a much higher standard for DPI on scans than Photoshop. Can I re sell artwork I buy on the BAE on a 3rd party platform? Yes, wwe are listed on and compatible with other Ethereum non-fungible exchanges, you will also be able to trade artwork peer to peer with anyone with an Ethereum ERC-721 compatible wallet. If you have any questions or need some more help please email us.